I shopped a little last weekend. We went swimming in Pansol. On our way back to Manila, we passed by the Nike Outlet store at the Total gasoline station at the northbound south super highway. Naka-sale siya. That’s great news for me kasi ang luma na ng mga exercise clothes ko. As in taon ko na siya ginagamit. I plan na i-career tong Muay Thai and boxing so I will really need quality exercise clothes. I found this sports bra on sale at Php 1,095 only from Php 1,895. I love the grey and pink color. Dahil ako si budburan mo ng glitters, I got this glittery sports bra at Php 600 only. The original price was Php 1,695. 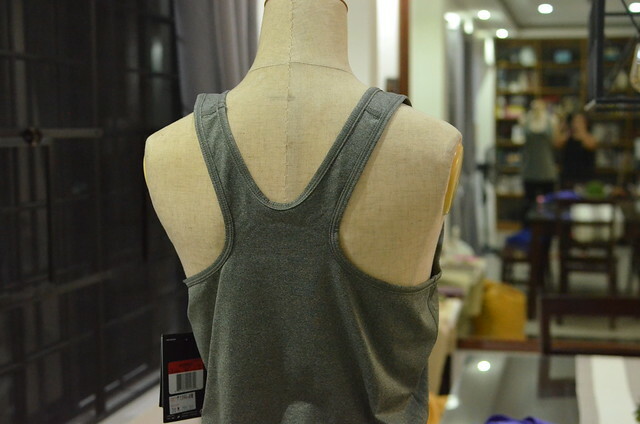 This top I got for Php 1,095. The original price was Php 1,395. This one naman was at Php 795. The original price was Php 1,195. I was also able to get a pair of leggings for Php 1,595 from the original price of Php 1,895. Sulit na din. There’s this sports shop that I want to check out also at Filinvest Mall. I heard mura daw ang mga binebenta dun and they have stuff for all kinds of sports. I wanna get that pair of socks na parang may rubber sa ilalim. That would be perfect for my Muay Thai. Para hindi nagbu-bruise ng bongga my feet. And then, these past few days, I noticed that my skin is getting pretty bad. I have three permanent DEEP vertical lines in between my eyebrows. My skin is so dry. I want to age gracefully like Wowa so I decided to finally invest in a good skin care regimen and stick to it. 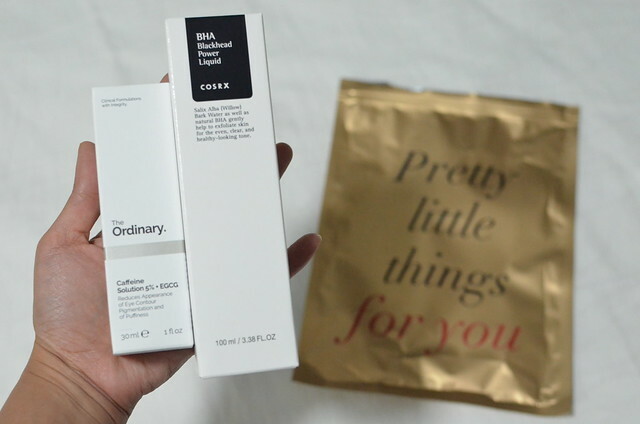 It was a coincidence that during this time, Eli (@momama_ph at Instagram) posted the beauty products that she uses. I like Eli’s skin and I really trust her sa mga ganyan plus wala akong alam except SKII and Kiehl’s so I bought almost all of the stuff that she said. Hahaha! You know, I cannot believe that some girls put more than 10 products on their face every freaking night! Ang tiya-tiyaga nila, emergerd. I’m so lazy to do that! Kaya tingnan niyo, ang pangit ng skin ko compared to them. Sounds complicated but I do hope it gets rid of my blackheads. 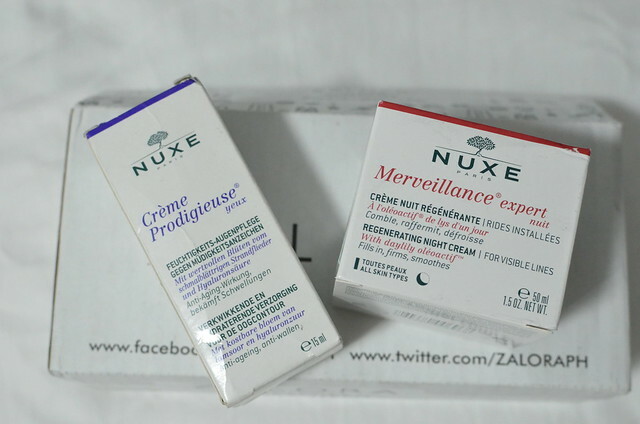 From Zalora, I got the Nuxe Merveillance Expert Night Cream at Php 2,450. I just bought it last weekend and now that I’m checking the price again for the blog, naka-sale na siya at Php 980. Kung hindi ka naman talaga ma-bwiset. From the website, “Maintain a fresh and youthful-looking skin using Merveillance Expert Night Cream from Nuxe. This regenerating night cream targets three key skin proteins – collagen, elastin and vimentin – to combat visible lines and loss of firmness.” Ang mahal, hindot. I can’t believe nagsale siya right after I bought it. Grrrrrr. Another product for my tired looking eyes, I bought the Nuxe Creme Prodigieuse last Sunday for Php 1,350. Pang-asar pa more because it’s on sale tonight for only Php 675. Inaasar talaga ako ng tadhana or may something sa akin si Zalora. Lelz. Anyway, I hope these products work on me. I need to find a good but non greasy sunblock for my face. Cai (@GlowByCai), who also has great skin, recommended Biore Aqua Rich Water Essence. I’ll look for it then I’ll try it. I need sunblock. It will save your skin big time. Wowa uses sunblock everyday even though she doesn’t go under the sun. Gayahin natin siya. I will need a trip to the salon for a facial very soon. One of these days, I’ll blog a review of the products I use on my face to see if they work. Do you have recommendations too? Please share! I think the sports shop in Filinvest is Decathlon and yes, they sell good stuff for a more affordable price, mumsh. Also, I would recommend Keihl’s sunblock. Non-greasy at super light and it also dries matte. Not like the usual sunblock that leaves white cast sa skin at super greasy. Sportswear I buy muther sa Uniqlo and Cotton On kasi ang ganda naman ng quality pero ang mura. Go ka din dun!! I should check out Uniqlo and Cotton On nga. Thanks muther! Meron naman pala sa Landmark!